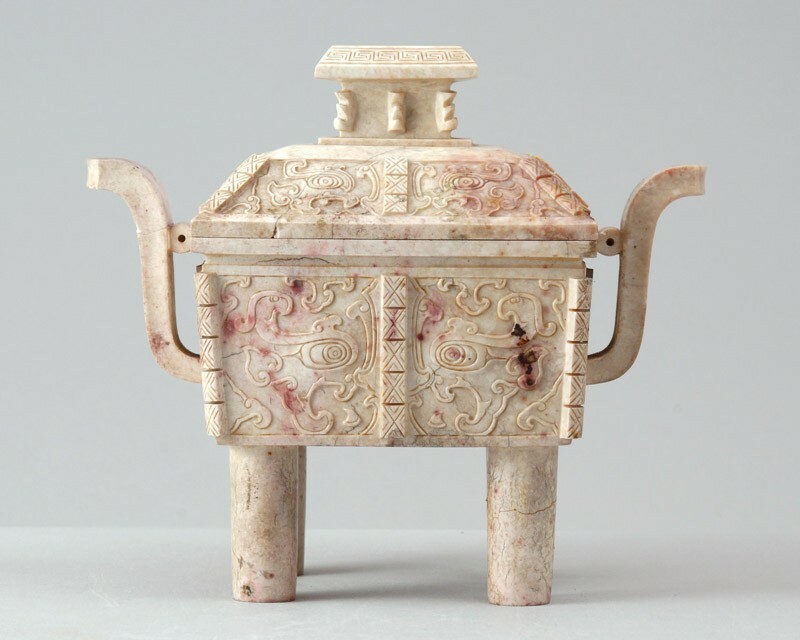 The piece is made in the form of an archaic bronze vessel (fang ding), of a white stone with pinkish and buff patches which appears to be artificially degraded and stained. Carved as a rectangular vessel, raised on four columnar legs, the vessel has raised notched flanges carved with diaper motifs at the corners and in the middle of the sides, and is decorated with a animal masks (taotie) in relief with prominent eyes and curved features. The short sides have large, outward curved handles formed of thick bands with central grooves, joined to the vessel by small tubular flanges. The domed cover is matchingly decorated, the hollow knob is raised on a plain panel and has notched flanges and a sloping rim with a key-fret design.